HELLO FROM MANCHESTER CENTRAL LIBRARY, one of the city's best-known and most remarkable buildings. It's big, it's round, it's white, its elegant, and it's full of... not just books, but lots of other stuff, including periodicals, CD-ROM's, videos, cassettes, music scores, newspapers, photographs, and much more besides. There's a theatre and snack bar in the basement, a shop on the ground floor and an internet access centre on the first floor. WISDOM IS THE PRINCIPAL THING THEREFORE GET WISDOM AND WITH ALL THY GETTING GET UNDERSTANDING. EXALT HER AND SHE SHALL PROMOTE THEE. SHE SHALL BRING THEE TO HONOUR WHEN THOU DOST EMBRACE HER. SHE SHALL GIVE TO THINE HEAD AN ORNAMENT OF GRACE A CROWN OF GLORY SHALL SHE DELIVER TO THEE. This inspiring quotation is taken from the Bible's Book of Proverbs. It's inscribed around the ceiling of the Great Hall (right), which at 127 feet in diameter is reckoned to be the largest central-domed reading room in Europe. That's not all that's record-breaking about this neo-classical palace of learning - It was the first steel-framed building in the UK, and is now the busiest public building in Manchester, with between 1.2 and 1.5 million visitors a year. Looking at photos from 1934, the interior looks wonderfully spartan and elegant, like a 19th century painting of one of the Grecian or Roman temples which evidently inspired architect Vincent Harris. Now many open spaces are filled with extra bookshelves and displays. There's a stationery shop in the middl of the Shakespeare Hall, and on the first floor exhibition area, you'll now find the Net-Works Centre - the recently opened Internet access facility. 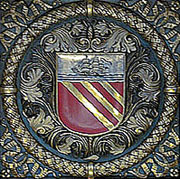 Like all services offered by the Central Library, it's free to all those who live, work or study in the City of Manchester. If you live on the wrong side of Chorlton Rd or across the River Irwell in Salford, you may have to pay a fee, but it's a small price for what's on offer here. Yes, everyone who's used the Central Library has their own memories of it. Many famous and distinguished people came here while at school or as undergraduates. One of the Central Ref's most famous alumni is Morrissey ex-lead singer of the Smiths. David tells me that during the height of their fame, the eccentric lead singer returned to the Central Library for a photo shoot. Unfortunately he hadn't applied for permission and a certain member of staff had no idea who he was, and promptly asked him and his entourage to leave. It was only later that colleagues informed her she's just thown out an internationally famous pop star. Morrissey might have found some of his own music in the Henry Watson Music Library, which has 396,000 items of sheet music from plain song to punk rock. The Central Library has books and other material on every conceivable subject, but if, like me, you're interested in the history and development of Manchester, then one of the best places you can go is the Local Studies Unit, on the first floor to the left. 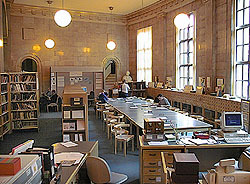 Here they have a huge selection of books, periodicals, maps, oral history recordings, census reports and material for family history researchers. My favourite part of the collection is the photo archive - comprising 10,000 local views accessible via two computer terminals. I've spent many hours here exploring the Manchester of past decades and centuries. And thanks to a recent Lottery grant, they're going to digitise a further 70,000 images. Eventually they'll be available for viewing at libraries throughout Manchester and - at some point in the future - on the Internet. At present, you can view a small but very interesting selection of old views of Manchester on the Local Studies Unit website, full address below. Later we went up on the roof of the building, which overlooks St Peters Square, in my opinion one of the most elegant and attractive parts of the city centre. 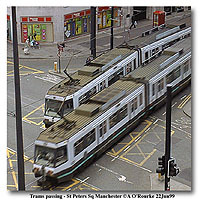 Metrolink trams stop just outside the Library, currently linking you with Altrincham, Bury and Piccadilly Station. Many incoming buses stop here too. Next door to the Library is the Town Hall Extension, where Manchester residents, like me, pay their Council Tax, and can access many more Council services. The Town Hall Extension was also designed by Vincent Harris, in a similarly ornate 1930's neo-Classical style, with patternwork that recalls the work of William Morris. Other buildings overlooking St Peters Square are Century House, built in 1937, Elisabeth House (1972), in the corner Peter House, dating from the same year as me, 1958, and dazzlingly ornamented Midland Hotel, 1912, now the Crowne Plaza Midland. 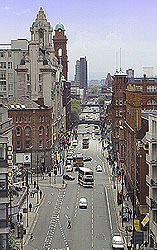 To the left of the library is Peter St, and behind it is Mount St, on the corner of which is Television House. The view from behind looks over the roof of the Friends Meeting House, towards Sunlight House. Panning round to the right, we look down on the corner of Albert Square, and coming back round to the front, we can almost see into the windows of the Town Hall Extension, whose concave facade fits around the north-eastern curve of the Library, forming the unique and atmospheric Library Walk. 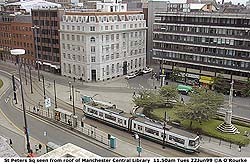 In the future, the Central Library, like other UK libraries will become the "street corner university", getting closer to the people, and making more and more use of new technology. This is the official policy of the Labour government, which is giving priority to library services, so the budget cuts and reductions in opening hours of the last decade are now a thing of the past. Also recommended by David Green is the EARL website which has an "ask a librarian" service, great if you're looking for information. 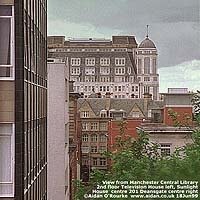 See www.mancunian.com for some personal reminiscences of the Central Library, illustrated with some of my photos. TODAY'S NEWS STORIES include the plan to extend the Metrolink tram service to the Airport, Rochdale, Ashton and other local destinations. The costs are to be covered by a tax on employers who offer parking to their workers. But many people are opposed to an extra tax on companies in Manchester -"Tolls will drive my firm out" says company director "Driven to the Limits" in today's Postbag. A NEW MINI-CITY is to be built on the banks of the Manchester Ship Canal near the Trafford Centre, it was announced a few days ago by Peel Holdings, owners of the Canal and the Trafford Centre. Trafford Quays will have waterside apartments, shops, cafes and water buses taking commuters up the canal to Salford Quays - I think I came up with an idea similar to that a couple of weeks ago! The new complex is to be built just across from where I took my "swans" photo in the previous EWM update. LOCAL PARKS are being visited by a group of MP's today - they'll be looking at their current state of repair and what needs to be done to restore them to their original splendour. Alexandra Park, Oldham, is on their itinerary, and also Phillips Park, near Bradford and the Commonwealth Games site. And in Hulme a brand new park will open next month the first new municipal park to open in Manchester for decades. THAT'S ALL FROM ME FOR TODAY, I haven't got anything special to say about any burning issue, so Eyewitness will keep his mouth shut! THE WEATHER over the past few days has been great - yesterday was cool but sunny, so was Sunday when the air over Manchester was clear, with great visibility. Today was pleasant with sunny spells , though it clouded over later. BBC Northwest Tonight's weather presenter Diane Oxberry predicts good weather for the weekend, so here's hoping. 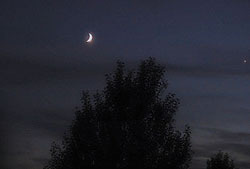 It's the summer solstice, so from tonight onwards, the nights get shorter. Driving up to Middleton the other night at 11pm, I was amazed by the amount of light in the northern sky. Here's a recent photo taken near Wilmslow Rd Rusholme with the new Agfa E-Photo 1280, which I used for all today's Library photos, apart from 1069.